We’re delighted to share some news on the upcoming film adaptation of THE GIRL WITH ALL THE GIFTS by M. R . Carey. The film is to star Gemma Arterton, Paddy Considine and Glenn Close, and is to be directed by Colm McCarthy – best known for his work on Sherlock, Peaky Blinders and Doctor Who. LONDON – Monday 23 March 2015. Altitude Film Sales has boarded SHE WHO BRINGS GIFTS, one of last year’s Brit List selected screenplays, adapted by acclaimed novelist M. R. Carey from his bestselling novel The Girl with all the Gifts. Director Colm McCarthy lauded helmer of hit British TV shows including Peaky Blinders starring Cillian Murphy and Tom Hardy, Sherlock with Benedict Cumberbatch and Martin Freeman, Doctor Who, Endeavour and The Tudors, will direct his first major feature. The cast includes Gemma Arterton (Tamara Drewe, The Disappearance of Alice Creed) who is currently starring in Marjane Satrapi’s The Voices following her West End musical stage debut in Made in Dagenham; Paddy Considine from BAFTA-winning British hit Pride, a BAFTA award-winning director for Tyrannosaur and soon to be seen in Macbeth with Michael Fassbender; and the multi-award-winning and six-time Oscar® nominated actress Glenn Close, soon to be seen in Tim Blake Nelson’s Anesthesia, Bjorn Runge’s The Wife, last year’s Guardians of the Galaxy and a just-completed starring run on Broadway in A Delicate Balance. SHE WHO BRINGS GIFTS is due to shoot in the UK in May 2015 and is produced by Camille Gatin, co-producer of James Marsh’s Shadow Dancer and Ricky Gervais’s Special Correspondents co-starring Eric Bana, and Angus Lamont, producer of the Berlin Competition Jury award-winning ’71 directed by Yann Demange. The feature has been developed with the support of the BFI Film Fund. SHE WHO BRINGS GIFTS is the story of Melanie, a girl who is full of questions about the world. Every morning, Melanie waits in her cell to be collected for class. When they come for her, Sergeant Parks keeps his gun pointing at her while two of his people strap her into a wheelchair. She thinks they don’t like her. She jokes that she won’t bite. But they don’t laugh. The Brit List is a compendium of stellar scripts by non-US writers, set up to complement the US Black List with previous scripts which have made the List in previous years including The King’s Speech, My Week with Marilyn and The Best Exotic Marigold Hotel. Altitude Film Sales has recently announced new projects it is representing internationally including Anthropoid, to be directed by Oscar® and BAFTA-nominated British filmmaker Sean Ellis (Metro Manila, Cashback), co-written by Ellis with Anthony Frewin (Colour Me Kubrick: A True . . . ish Story) and starring Jamie Dornan (Fifty Shades of Grey, The Fall) and Cillian Murphy (Inception, The Dark Knight Rises); and Palio, a new documentary from award-winning filmmaker Cosima Spender (Without Gorky, Dolce Vita Africana) and co-produced by James Gay-Rees (Amy, Senna) and John Hunt. 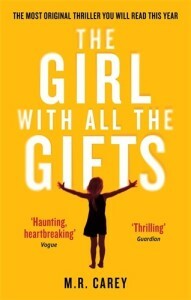 The Girl with all the Gifts was first published in 2014 by Orbit. Altitude is involved in film production, financing, international sales and distribution. The company’s first creative partnerships are with filmmakers Jalmari Helander, Petri Jokiranta, and Alex Garland for Big Game starring Samuel L. Jackson, Onni Tommila, Jim Broadbent, Ray Stevenson and Mehmet Kurtulus and which premiered at TIFF in their cult MIDNIGHT MADNESS section; producer Gregor Cameron and director Owen Harris for Kill Your Friends, based on the cult satirical novel by John Niven and starring Nicholas Hoult, James Corden and Georgia King; James Watkins (The Woman in Black, Eden Lake) and Simon Duric for The Loch and to star Peter Mullan; and director Jabbar Raisani for Outpost 37. The Altitude sales slate also includes Anthropoid to be directed by Sean Ellis and starring Jamie Dornan and Cillian Murphy; Palio, directed by award-winning filmmaker Cosima Spender and produced by James Gay-Rees and John Hunt, premiering at the 2015 Tribeca Film Festival; Kill Your Friends, based on the cult satirical novel by John Niven, directed by Owen Harris and starring Nicholas Hoult, James Corden and Georgia King; 2014 TIFF Midnight Madness selection Big Game, directed by Jalmari Helander and starring Samuel L. Jackson and Onni Tommila; SAS: Red Notice based on the Andy McNab bestselling novel, to be directed by Nick Love and starring Luke Evans; Bolshoi Babylon from the Oscar®-winning producer Simon Chinn, Mark Franchetti and director Nick Read; Catch Me Daddy (2014 Cannes Directors’ Fortnight) from filmmaker brothers Daniel and Matthew Wolfe and released in the UK last month; Get Santa, a family comedy directed by Christopher Smith and starring Jim Broadbent; Son of a Gun directed by Julius Avery and starring Ewan McGregor, Brenton Thwaites and Alicia Vikander; The Loch, co-written by James Watkins and Simon Duric with Duric to direct and starring Peter Mullan; Outpost 37 directed by Jabbar Raisani and starring Rick Ravenello, Matthew Holmes and Reiley McClendon; Fishing Without Nets, directed by Cutter Hodierne and winner of the Sundance US Dramatic Directing award; The Rendlesham UFO Incident directed by Daniel Simpson and starring Robert Curtis, Abbie Salt and Danny Shayler; Pulp – A Film About Life, Death & Supermarkets, a celebration of alternative rock band Pulp directed by Florian Habicht; The Call-Up directed by Charles Barker and starring Max Deacon and Morfydd Clark; and 47 Meters Down directed by Johannes Roberts.